I know you just read that title and you were like, “What the heck is this guy talking about?? ?” I want you to read through this entire article before you form your opinion. After reading, if I haven’t convinced you why God loves the Illuminati, then I’ll give you the right to create a YouTube video on me describing how I am part of the one eyed crew! 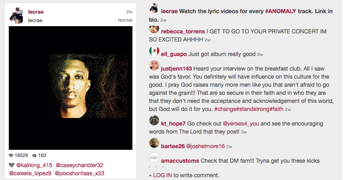 The whole reason I started thinking about this idea was due to some of the disturbing commentary that I read on the Instagram account of the rapper, Lecrae. 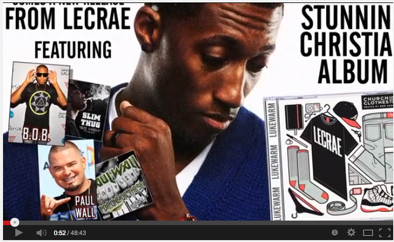 For those who don’t know who Lecrae is, he is a rapper and founder of Reach Records. 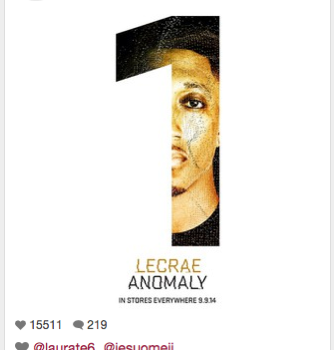 He’s well known in the Christian rap circles, but really made his impact known by becoming #1 on the Billboard a couple of weeks ago, very hard for any artist to achieve. I decided to also look on YouTube, and what do you know?? There were videos accusing him of belonging to the Illuminati. The Illuminati is described as people belonging to the occult, Freemasons, elite societies and the such, here is the most simplistic definition of what the Illuminati means: people claiming to possess special enlightenment or knowledge of something. Along with the accusations, I do want to show you some of the more supportive commentary that I found as well. 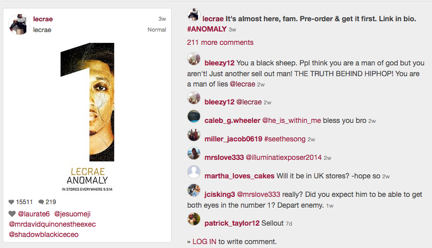 I personally do not believe that Lecrae is a part of the Illuminati. I also think the most effective thing we can do for those that are in the Illuminati or any cult for that matter is pray! So now that you know what the Illuminati is, why would a loving God love something so evil. The truth is He doesn’t love evil, but guess what? 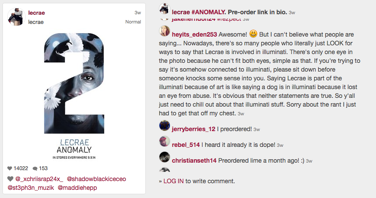 He loves the people that are a part of the Illuminati and you can’t have the Illuminati without the people. 1. God hates the sin we do, but loves his children. What sounds worse? Saul killing Christians or someone being a part of an occult society? They’re both wrong, but God still loved Saul, gave him an opportunity to receive Jesus and he turned out to be one of the most devout men of the bible. Speaking of levels of sins, all sin, no matter how “small” or “great” is against an infinite and eternal God, and is therefore worthy of an infinite and eternal penalty. A good person who lies but never accepted Jesus as Lord and Savior has the same fate as the illuminati-affiliated individual who denounces Jesus. The keywords in this passage are “world” and “whosoever.” God loves the entire world, including the world system that He gave his Son Jesus to die and WHOSOEVER believes will have everlasting life. That doesn’t leave anybody out, (rapists, terrorists, Satanists, child molesters, thieves, prostitutes, pimps, drug dealers, gang bangers, homosexuals, murderers, and so on). While we are on the topic, this even means men who have beaten women like Ray Rice, even have access to God’s love after the terrible things they’ve done. In fact it has been reported that he and his wife just gave their lives to the Lord. Would you believe that??? 3. If we are living, we have an opportunity to receive Jesus! As long as a person is alive and breathing, they still have a chance to chase God’s mercy, and if they accept God He will wash their sins as white as snow, though they are as red as scarlet. Imagine if we loved on the lost and even the Illuminati like that? If God can love the sinners that we once were, why can’t God love the Illuminati? Just like God, I am in no way condoning the Illuminati or the actions of those involved, I am just taking a different approach to the whole aspect of the Illuminati. He died for us while we were sinners; doing the things we did no matter what we did even if it’s an occult practice, witchcraft, voodoo or any other type of evil. Read a story in Acts 19:17-19 which an entire fleet of people who practiced witchcraft, sorcery, and decided to put down the spells and pick up their cross. If God had compassion on them, what has changed today? Remember that God loves his people no matter what they do, and our job is to pray, tell the truth in love, and show the love of Christ so that they too can denounce their sins and come to Jesus.